With a strong link to our stress patterns, time management is a critical part of what we do day to day. Using SMARTER objectives, this workshop goes the extra mile, and in addition to other time management courses, bridges the gap between time and stress and introduces new thinking on managing time proactively. Time management can a practiced art, producing stunning effects when all the right elements come together. Less stress, more time – doesn’t that sound good?! Effective time management has become such a part of our everyday lives but a lot of the planning detail is lost as we struggle through the day towards our objectives. This refreshing workshop reinforces some of the key elements for successful time management. Get to know what you really spend your time doing! 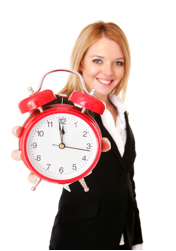 In order to work more efficiently, you need to have a good grasp of time management skills. If your daily routine lacks prioritisation of tasks and activities, or you find yourself procrastinating often, then this workshop is for you. You will also learn how to eliminate unnecessary time wasters and how to delegate, even if you are not a manager or supervisor. Personal goal setting is becoming increasingly more important to us all, both in our professional and private lives. Time management doesn’t mean running your whole life by the clock, it simply means empowering you with the skills necessary for an easier way of working. Develop routines for priority tasks that have to be done on a regular basis. This will ensure that these particular tasks are completed and not missed or procrastinated over. These routines will help you improve the planning function. Whenever you think of something that must be done, jot it in your diary on the day that you plan to do it. And don’t forget to allocate some time against the task. Keep urgent and critical tasks visible on your desk and in your diary. That way, you are sure not to miss deadlines and you will be reminded of these as you progress during the day. Make the transition from one day to the next both easier and more productive by developing a routine for closing each workday and starting the next. For example, an organized desk at close of business is key to ensuring that you start in the right frame of mind the next day you return to work. A cluttered or untidy desk can equal failure. Learn to say “No” politely to a colleague if you really can’t spare the time to squeeze something in to your busy schedule. Communicated in the right way, no one will get offended and you will complete the task in hand without disruption. Finally, if your boss is piling work on you, ask them what is urgent. Get them to prioritise the work that they have given you, rather than you worrying about what you should be doing next. Nobody won any prizes for guessing and getting it wrong! Here are some suggestions for managing time more effectively. Remember, there is no “one size fits all” so pick what applies to you. Organise your working area so that everything you use on a regular basis is visible and within reach. This will help focus on priorities. Develop routines for repetitive tasks such as checking email and even regular meetings. Make sure you schedule tasks for when you are at your best. For example, there is no point in trying to write up a project at 9am if your optimum time for writing is 2pm onwards. Develop a planning mindset by finishing each day with completing your time management grid for the following working day. Use a planner such as Outlook to block off time for projects, calls, email scheduling and meetings. Always allocate more time to tasks, that way you may well win some time back. Practice stress management and resilience activities, as in addition to the usual benefits, reduced anxiety will free up more working memory and boost confidence.